Synthetic cannabinoids represent the largest group of substances currently monitored in Europe by the EMCDDA through the EU Early Warning System. Current knowledge on these substances and trends in production, availability, use and harms are presented in this analysis. Synthetic cannabinoid receptor agonists (commonly referred to as ‘synthetic cannabinoids’) are a group of substances that mimic the effects of (–)-trans-Δ9-tetrahydrocannabinol (THC), which is the substance that is primarily responsible for the major psychoactive effects of cannabis. Like THC, the synthetic cannabinoids bind to the cannabinoid receptors in the body. This is why these substances have been used to create a large range of ‘legal high’ products sold as legal replacements for cannabis. They are the largest group of new psychoactive substances monitored by the European Monitoring Centre for Drugs and Drug Addiction (EMCDDA). ‘Legal high’ products containing synthetic cannabinoids have been sold as ‘herbal smoking mixtures’ since the mid-2000s. These products do not contain cannabis, but when smoked produce similar effects. They have been subject to innovative marketing approaches and are widely and openly available on the web, and in some countries in bricks-and-mortar (‘head’ and ‘smart’) shops. The number of synthetic cannabinoids, their chemical diversity and the speed of their emergence make this group of compounds particularly challenging in terms of detection, monitoring, and responding. Suppliers simply aim to mimic the effects of THC. In essence, this makes each synthetic cannabinoid disposable. When one synthetic cannabinoid is, or is about to be, legally controlled manufacturers can have one or more replacement substance ready for sale. Little is known about how these substances work and their toxic effects in humans. However, their use has caused many serious poisonings and even deaths — sometimes these have manifested as outbreaks of mass poisonings. It is possible that, along with being highly potent, some may also have long half-lives, potentially leading to a prolonged psychoactive effect. In addition, it appears that at least some of these substances have an effect on other physiological functions in the body beyond effects on the cannabinoid receptors. This analysis aims to provide an update on the current knowledge of these substances and their effects, and trends in production, availability and use. Despite internet rumours since the mid-2000s of ‘herbal smoking mixtures’ sold as ‘legal highs’ that could produce ‘strong’ cannabis-like effects, it wasn’t until 2008 that forensic investigators in Germany and Austria first detected the synthetic cannabinoid JWH-018, in a product sold under the brand name ‘Spice’ (1). Subsequently several cannabinoids were detected in smoking mixtures or so-called incense/room odorisers. Typical of these were Spice Gold, Spice Silver and Yucatan Fire, but many other products later appeared. Many of the cannabinoids that have been detected in these products were first developed by scientists investigating how cannabinoids affect the body and to see if they could work as medicines to treat a number of diseases and their symptoms — such as neurodegenerative diseases, drug dependence, pain disorders and cancer. However, so far it has proved difficult to separate the desired medicinal properties from unwanted psychoactive effects. Synthetic cannabinoids represent the largest group of substances currently monitored by the EU Early Warning System. One was reported in 2008; 9 in 2009; 11 in 2010; 23 in 2011; 30 in 2012; 29 in 2013; 30 in 2014; 25 in 2015; and 11 in 2016 — with a total of 169 synthetic cannabinoids having been notified to the EMCDDA as of December 2016 (2). 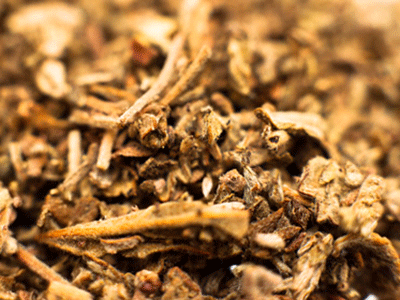 Synthetic cannabinoids play an important role in the rapidly evolving ‘legal highs’ market. ‘Legal highs’ is an umbrella term used to describe non-regulated (new) psychoactive substances that are usually intended to mimic the effects of controlled drugs and are sold on the open market. This is an area characterised by limited data on use, with the risks and harms largely unknown, and where highly potent drugs are of serious concern. In the case of smoking mixtures containing synthetic cannabinoids, for example, there can be considerable variability both within and between different batches of the products, in terms of both the substances and the amount present. Most of the synthetic cannabinoids that are used in ‘legal high’ products are manufactured by chemical companies based in China. They are shipped as bulk powders to Europe using express mail and courier companies; larger amounts may by shipped by air or sea cargo. Multi-kilogram shipments are frequently intercepted by authorities in Europe. While the purity of these bulk powders are rarely determined, one study from South Korea reported purities of between 75 % and 90 % for bulk powder samples (3). In 2015 over 24 000 seizures of synthetic cannabinoids (24 210) were made in Europe weighing more than 2.3 tonnes (2 334 kg), of which over 400 kg (444.245 kg) was bulk powder. This represents an increase of almost 7 000 seizures and over 1.6 tonnes (mostly consisting of plant material) compared to 2014. Once in Europe, the retail products are put together. Damiana (Turnera diffusa) and Lamiaceae herbs such as Melissa, Mentha and Thymus (4) are commonly used as the plant base for the smoking mixtures. The synthetic cannabinoids are mixed with or sprayed onto the plant material, typically on an industrial scale using solvents such as acetone or methanol to dissolve the powders; equipment like cement mixers are then used to mix the ingredients together. From there, the mixture is then dried and packaged. They are then sold on the internet by ‘legal high’ retailers and in bricks-and-mortar head shops. Due to the high potency of some synthetic cannabinoids, the amount of powder needed for each packet can be in the order of a few tens of milligrams. This means that each kilogram of bulk powder may produce thousands of packets of ‘legal highs’. The discovery of processing and packaging facilities and large quantities of synthetic cannabinoids in the Netherlands and Belgium suggests the involvement of organised crime in the distribution process. There is also evidence of a significant internet retail trade within Europe, with customs and police making regular seizures of small quantities of these products. Monitoring of online shops selling ‘legal high’ products provides some insight into the range of smoking mixtures available for purchase, many of which are likely to contain synthetic cannabinoids. Such monitoring, when combined with test purchasing of products for sale, is also a way of both keeping track of how the substances contained in a product change over time, and helping in the early detection of new cannabinoids that appear on the market. Information on the extent to which synthetic cannabinoid products are used is limited; however, knowledge of the situation is improving as more countries incorporate questions about their use in general population surveys. From the information that is available, it would appear that the prevalence of their use in the general population is low in Europe. A number of surveys aimed at examining the prevalence of use of ‘Spice’-like products have been launched but their coverage and representativeness remains limited. There are notable differences between the prevalence of use of synthetic cannabinoid products between the European and US drug markets. The most recent US prevalence data comes from the 2014 US Monitoring the Future survey of students, which suggests use is declining, with last year prevalence for 17- to 18-year-olds of 5.8 % in 2014, down from 7.9 % in 2013 and 11.3 % in 2012 (29). In 2011, according to the same survey, ‘synthetic marijuana’ was the second most widely used drug after cannabis, with last year prevalence of 11.4 %. A number of surveys in European countries also report on the use of synthetic cannabinoids, although they are not comparable as they use different methods, sampling frames and terminology. Overall, these studies indicate very low prevalence levels. The United Kingdom (England and Wales) asked about the use of ‘Spice’ in two consecutive household surveys and reported lifetime prevalence levels for adults (16–64) at 0.2 % in 2010/2011 and 0.1 % in 2011/2012 (6,7). In the British Crime Survey for England and Wales covering 2014/2015 a total of 0.9 % of adults (16–59) had used new psychoactive substances in the last year, of which 61 % had used a herbal smoking mixture (8). The question was not repeated in subsequent years due to the low prevalence rate. In Spain a 2014 national survey on drug use among students aged 14–18 with a sample of 37 486 identified low levels of use of ‘Spice’ products, with prevalence rates of 0.8 % in 2014 for lifetime use, down from 1.4 % in 2012 and 1.1 % in 2010 (9,32). In a general population survey conducted in 2013 also in Spain, 0.5 % of the 23 136 respondents (aged 15 to 64) reported lifetime use of Spice (10). A 2014 French survey of adults (18–64) with a question about the use of ‘synthetic cannabinoids’ reported lifetime use of 1.7 %. First-time users of these new synthetic products are mostly males (2.3 % vs. 1.2 % of females) and from the youngest generation (under 35 years): 4.0 % of 18- to 34-year-olds had tried synthetic cannabinoid compared to 0.6 % of 35- to 64-year-olds (11). Another survey in France, among young people aged 17, reported that 1.7 % of them have previously used a synthetic cannabinoid (12). The Swedish Council for Information on Alcohol and Other Drugs (CAN) 2015 survey asked students about their consumption of new psychoactive substances. It found a decrease compared to other years in the 9th and 11th grades, with 1.6 % and 3.2 % respectively reporting use at some stage. Synthetic cannabinoids were the most commonly used new psychoactive substance reported by those in the 9th grade and the second year of upper secondary school (37). The German city of Frankfurt has studied the use of smoking mixtures and ‘Spice’ among students aged 15–18. They reported lifetime levels of use of 7 % in 2009; 9 % in 2010; and 7 % in 2011 and 2012 (13,14,15). In 2013 lifetime use of smoking mixtures fell to 5 %, but increased to 6 % in 2014 and remained at 6 % in 2015; however, this is still below the values from 2009–12 (16,17, 33). Students reporting the consumption of ‘Spice’ were, for the most part, experienced cannabis consumers. Finally, a number of studies among particular groups (clubbers, internet users, etc.) with non-probabilistic samples have generally identified higher levels of synthetic cannabinoid use than among the general population. The 2012 Global Drug Survey, for example, reported last year prevalence levels of 3.3 % among all UK respondents (not representative of the general population) and 5.0 % among UK regular clubbers (18). In the United Kingdom, use of synthetic cannabinoids among prisoners is of particular concern. A survey conducted in 2016 in the United Kingdom’s prisons found 33 % of the 625 inmates reported the use of ‘Spice’ within the last month (this compares to 14 % of last month cannabis use). Variation in the prevalence levels of ‘Spice’ use within the last month from prison to prison ranged from 15 % to 71 %. Those individuals who had used ‘Spice’ within the last month, were asked about the weekly frequency of use; results showed that 31 % had used ‘Spice’ once or twice a week, 8 % once a week, 15 % 2-3 times a week and 46 % almost daily (30). A previous study conducted in 2015 by the HM Inspectorate Prisons interviewed 1 376 prisoners in eight prisons and found that 10 % were using ‘Spice’ in their respective prison (31). The adverse health effects associated with synthetic cannabinoids are linked to both the intrinsic properties of the substances, what the body does to the substances, and to the way the products are produced. There has been a large number of non-fatal poisonings, and a smaller number of deaths are associated with their use (19,20). As some of these compounds are very potent, the potential for toxic effects appears to be high. These risks may be added to by the manufacturing process, which can lead to an uneven distribution of the substances within the plant material. This may result in some products containing ‘hot pockets’ where the cannabinoid is highly concentrated, leading to doses that are higher than intended and increasing the risk of serious adverse events (21,22). It is also possible that some of the adverse effects are due to mechanisms other than interaction with the cannabinoid receptors, for example by interfering with other physiological functions in the body (23). A recent systematic review of adverse events associated with synthetic cannabinoid products found that agitation, nausea and an abnormally fast, racing heartbeat were frequently reported poisoning symptoms (17); while serious adverse events — such as stroke, seizure, heart attack, breakdown of muscle tissue, kidney damage, psychosis and severe or prolonged vomiting — and associated deaths were less common (17). Symptoms suggestive of dependence and withdrawal have also been reported (22). Overall, estimating how common these adverse events are is difficult because, among other things, the total number of people exposed to the drugs is unknown (17). One of the most striking features of synthetic cannabinoid products is their ability to cause outbreaks of mass poisonings. Sometimes this involves hundreds of people over a short period of time — which has been a major problem in the past few years in the United States and Russia. In 2014 in Russia the cannabinoid MDMB-FUBINACA was linked to more than 600 poisonings, including 15 deaths, over a two-week period (23). Early in 2016 this substance was identified on the European market, triggering a public health alert from the EMCDDA to its early warning network. In 2015 there was another large outbreak in the United States, which appears to have been linked partly to a substance called ADB-FUBINACA (24,25). While these types of outbreaks appear to be rare in Europe, in 2015 more than 200 hospital emergencies were reported in less than a week after people were reported to have smoked a product called ‘Mocarz’ in Poland. In July 2016, MDMB-CHMICA was the first synthetic cannabinoid receptor agonist to be risk-assessed by the EMCDDA (35) and it has recently been subjected to control measures and criminal penalties throughout Europe (36). MDMB-CHMICA is classed as a potent and full agonist at the CB1 receptor and has also been shown to be an agonist at the CB2 receptor. At the time of the risk assessment, 25 acute intoxications and 28 deaths associated with MDMB-CHMICA had been reported to the EMCDDA. In 12 of the cases, MDMB-CHMICA was reported as, either the cause of, or likely to have contributed to, the death. In three cases, it was the only substance detected. MDMB-CHMICA has been available on the European Union drug market since at least August 2014, and, at the time of the risk assessment, it had been detected in 23 Member States, Turkey and Norway. Information reported to the EMCDDA and Europol indicated that over 120 kg of MDMB-CHMICA had been seized with approximately 67 kg as herbal material and approximately 46 kg in powder form. The largest single bulk seizure reported to the EMCDDA, which was 40 kg of highly pure powder containing MDMB-CHMICA, originated in China (34). EMCDDA monitoring of serious adverse events and current knowledge of the pharmacological and toxicological effects of some synthetic cannabinoids, show that these compounds can cause serious harm to human health. However, at present the mechanisms of how this happens are poorly understood. From the start of the synthetic cannabinoid phenomenon these substances have largely been detected in products sold as ‘herbal smoking mixtures’. More recently, however, several countries have also reported finding the substances in products that look like cannabis resin, either in branded ‘legal high’ products such as ‘Afghan Incense’ or simply passed off as cannabis resin on the illicit market. This development is likely to be a response to the popularity of cannabis resin in many countries. Synthetic cannabinoids have also been detected in mixtures containing other new psychoactive substances, such as stimulants, hallucinogens and sedative/hypnotics; this may be deliberate or accidental. In a small number of cases, the presence of synthetic cannabinoids has been detected in what appear to be ecstasy tablets or capsules. In Hungary and the United States this has led to clusters of acute poisonings (26). Another recent development has been the discovery of synthetic cannabinoids in the liquid-filled cartridges for use in electronic cigarettes; this most likely reflects the recent popularity of ‘vaping’ among young people. The EMCDDA has been closely monitoring developments relating to synthetic cannabinoids since their identification on the European market in 2008. A striking feature has been the way in which this chemical family has evolved and adapted during this time. It is clear that the innovative chemical substitution patterns that have characterised this phenomenon mean that continued close monitoring of new developments in the field — including synthetic cannabinoid-related harms — will be essential. (1) EMCDDA (2009), Understanding the ‘Spice’ phenomenon, EMCDDA Thematic paper, Publications Office of the European Union, Luxembourg. (2) For the purposes of monitoring within the framework of the EU Early Warning System, the term ‘synthetic cannabinoids’ is used here to include: the large number of synthetic cannabinoid receptor agonists (such as JWH-018 which is a CB1 and CB2 receptor agonist) that have been detected on the European drug market; a much smaller number of allosteric modulators (such as Org 27569) that change the structure of the cannabinoid receptors leading to altered activity when a ligand binds to the receptors; and substances that act as inhibitors of fatty-acid amide hydrolase (FAAH), which is the enzyme responsible for breaking down the endocannabinoid anandamide (such as URB597). This Perspective on Drugs only discusses the synthetic cannabinoid receptor agonists. (3) Choi, H., Heo, S., Choe, S., et al. (2013), ‘Simultaneous analysis of synthetic cannabinoids in the materials seized during drug trafficking using GC-MS’, Analytical and Bioanalytical Chemistry, 405(12), pp. 3937–3944. (4) Ogata, J., Uchiyama, N., Kikura-Hanajiri, R. and Goda, Y. (2013), ‘DNA sequence analyses of blended herbal products including synthetic cannabinoids as designer drugs’, Forensic Science International, 227(1–3), pp. 33–41. (5) National Institute on Drug Abuse (2014), ‘Monitoring the Future Survey 2014, overview of findings’, NIDA, Bethesda, MD. (6) Smith, K. and Flatley, J. (eds) (2011), Drug misuse declared: Findings from the 2010/11 British Crime Survey, England and Wales, Home Office, London. (7) Office for National Statistics (2012), Drug misuse declared: Findings from the 2011/12 Crime Survey for England and Wales, Home Office, London. (8) Home Office (2015), ‘Tables for drug misuse: Findings from the 2014 to 2015 CSEW’, Home Office, London. (9) Spanish Observatory on Drugs (2012), Survey on drug use among Secondary School Students in Spain 2012 (ESTUDES). (11) Beck, F., Richard, J.-B., Guignard, R., Le Nezet, O. and Spilka, S. (2015), ‘Levels of drugs use in France in 2014’, Tendances 99. (12) Spilka, S., Le Nézet, O., Ngantcha, M. and Beck, F. (2015), ‘Drug use in 17-year-olds: Analysis of the ESCAPAD survey’, Tendances 100. (13) Werse, B., Müller, O., Schell, C. and Morgenstern, C. (2011), Jahresbericht MoSyD: Drogentrends in Frankfurt am Main 2010, Centre for Drug Research, Frankfurt am Main. (14) Werse, B., Bernard, C., Schell-Mack, C. and Morgenstern, C. (2012), MoSyD Jahresbericht 2011: Drogentrends in Frankfurt am Main, Centre for Drug Research, Frankfurt am Main. (15) Bernard, C., Werse, B. and Schell-Mack, C. (2013), MoSyD Jahresbericht 2012: Drogentrends in Frankfurt am Main, Centre for Drug Research, Frankfurt am Main. (16) Werse, B., Morgenstern, C. and Sarvari, L. (2014), MoSyD Jahresbericht 2013: Drogentrends in Frankfurt am Main, Centre for Drug Research, Frankfurt am Main. (17) Werse, B., Kamphausen, G., Egger, D., Sarvari, L. and Müller, D. (2015), MoSyD Jahresbericht 2014: Drogentrends in Frankfurt am Main, Centre for Drug Research, Frankfurt am Main. (18) Guardian/Mixmag Survey (2012), accessed 13 March 2013. (19) Tait, R. J., Caldicott, D., Mountain, D., Hill, S. L., Lenton, S. (2016), ‘A systematic review of adverse events arising from the use of synthetic cannabinoids and their associated treatment’, Clinical Toxicology (Philadelphia) 54(1), pp. 1–13. (20) American Association of Poison Control Centers (n.d.), ‘Synthetic cannabinoids’, AAPCC, Alexandria, VA.
(21) Lindigkeit, R. 1., Boehme, A., Eiserloh, I., et al. (2009), ‘Spice: A never ending story?’, Forensic Science International, 191(1–3), pp. 58–63. (22) Uchiyama, N., Kikura-Hanajiri, R., Ogata, J. and Goda, Y. (2010), ‘Chemical analysis of synthetic cannabinoids as designer drugs in herbal products’, Forensic Science International, 198(1–3), pp. 31–38. (23) Fisar, Z. (2010), ‘Inhibition of monoamine oxidase activity by cannabinoids’, Naunyn Schmiedeberg’s Archives of Pharmacology, 381(6), pp. 563–572. (24) Macfarlane, V. and Christie, G. (2015), ‘Synthetic cannabinoid withdrawal: A new demand on detoxification services’, Drug and Alcohol Review 34(2), pp. 147–153. (25) Shevyrin, V., Melkozerov, V., Nevero, A., et al. (2016), ‘Identification and analytical characteristics of synthetic cannabinoids with an indazole-3-carboxamide structure bearing a N-1-methoxycarbonylalkyl group’, Analytical and Bioanalytical Chemistry 407(21), pp. 6301–6315. (26) Kasper, A. M., Ridpath, A. D., Arnold, J. K., et al. (2015), ‘Severe illness associated with reported use of synthetic cannabinoids: Mississippi, April 2015’, Morbidity and Mortality Weekly Report 64(39), pp. 1121–1122. (27) Drug Enforcement Administration (2015), ‘Proposed rule schedules of controlled substances: Temporary placement of the synthetic cannabinoid MAB-CHMINACA into Schedule I’, Federal Register 80(179), pp. 55565–55568. (28) Brenneman, R., Papsun, D. M., Logan, B. K. and Neavyn, M. J. (2016), ‘Death-like slumber: Toxic outbreak of AB-FUBINACA’, Journal of Medical Toxicology, 12(1), p. 39. (29) Johnston, L. D., O'Malley, P. M., Miech, R. A., Bachman, J. G., & Schulenberg, J. E. (2016). Monitoring the Future national survey results on drug use, 1975-2015: Overview, key findings on adolescent drug use. Ann Arbor: Institute for Social Research, The University of Michigan, pp. 98. Available at: http://www.monitoringthefuture.org/pubs/monographs/mtf-overview2015.pdf. (33) Werse, B., Egger, D., Sarvari, L., Kamphausen, G., and Müller, D. (2016), MoSyD Jahresbericht 2015: Drogentrends in Frankfurt am Main, Centre for Drug Research, Frankfurt am Main. (34) EMCDDA–Europol Joint Report on methyl. 2-[[1-(cyclohexylmethyl)indole-3-carbonyl]amino]-3,3-dimethylbutanoate (MDMB-CHMICA). EMCDDA–Europol , Lisbon, July 2016. Available at: http://emcdda.europa.eu/publications/joint-reports/mdmb-chmica. (35) EMCDDA (2017). Report on the risk assessment of methyl 2-[[1-(cyclohexylmethyl)-1H-indole-3-carbonyl]amino]-3,3-dimethylbutanoate in the framework of the Council Decision on new psychoactive substances. Available at: [insert link when available]. (37) Public Health Agency of Sweden (2016), Drugs workbook, Stockholm, unpublished. In an attempt to make the chemistry of the synthetic cannabinoids more readily understandable, a model is presented here to help explain the chemical make-up of these compounds. The synthetic cannabinoids are chemically diverse, what they share is their ability to bind to the cannabinoid receptors. However, the structure of the majority of synthetic cannabinoids can be broken down into four key parts: the core and substituents, the link section, the ring and substituents, and the tail section. If you select the right combination of component molecules, a synthetic cannabinoid will appear. Hint: click on a molecule again to 'toggle' its selection state. Over 620 new psychoactive substances are currently monitored by the EMCDDA through the EU Early Warning System, 169 of which are synthetic cannabinoid receptor agonists. 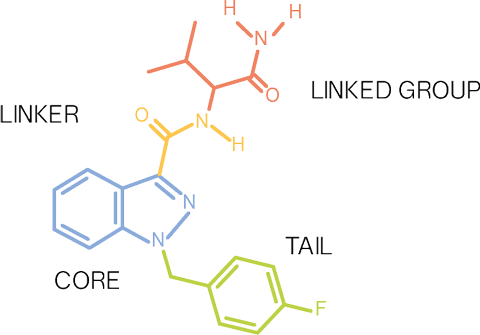 14 recognisable chemical families of synthetic cannabinoids are known. Many of the synthetic cannabinoids monitored by the EMCDDA through the EU Early Warning System have code names that relate to their discovery. In some cases they are derived from the initials of the name of the scientists that first synthesised them: e.g. ‘JWH’ compounds after John W. Huffman and ‘AM’ compounds after Alexandros Makriyannis. In other cases code names may originate from the institution or company where they were first synthesised, the ‘HU’ series of synthetic cannabinoids being from the Hebrew University in Jerusalem, or ‘CP’ from Carl Pfizer. In some cases names have probably been chosen by those making ‘legal high’ products to help market the products. Striking examples of this are ‘AKB-48’ and ‘2NE1’, alternative names used for APINACA and APICA. ‘AKB-48’ is the name of a popular Japanese girl band and ‘2NE1’ is the name of a girl band from South Korea. Finally, the synthetic cannabinoid XLR-11, appears to have been named after the first liquid fuel rocket developed in the USA for use in aircraft, perhaps alluding to the vendor’s intention for those who consume the substance. Ordering the components in this manner follows the ordering as seen in their longer chemical names, as with APICA: N-(1-adamantyl)-1-pentyl-1H-indole-3-carboxamide. When a tail substituent is present (i.e. 5F) this will be displayed at the front of the name and linked group substituents will be placed before the linked group; core substituents will be placed at the end of the code. The letter codes used are based not only on the letter used but also on the ordering of letters. For example, A identifies the amine in the linked group; CA identifies the carboxamide. By following the syntax and codes described, synthetic cannabinoids that follow this structure will have a unique short name. EMCDDA (2015), ‘Synthetic cannabinoids and “Spice” drug profile’, EMCDDA website. EMCDDA and Europol (2013), EU drug markets: A strategic analysis, EMCDDA Joint publications, Publications Office of the European Union, Luxembourg. Gurney, S. M. R., Scott, K. S., Kacinko, S. L., Presley, B. C. and Logan, B. K. (2014), ‘Pharmacology, toxicology, and adverse effects of synthetic cannabinoid drugs’, Forensic Science Review 26, pp. 53–78. EMCDDA (2015), ‘New psychoactive substances in Europe. An update from the EU Early Warning System (March 2015)’, EMCDDA, Lisbon, March 2015.